Most Evangelicals who celebrate Reformation Day do so on October 31, which is the day that Martin Luther nailed his famous 95 theses to the Castle Church door in Wittenburg in 1517. The debate that ensued led to a full outbreak of reformation and to Luther's trial at the Diet of Worms in 1521. So, I offer the above video as a reminder of this important occasion in the history of the Church. The clip is taken from the excellent 1953 film, Martin Luther, in which Luther was wonderfully portrayed by Niall MacGinnis. I really like the way the film employs Luther's famous hymn, A Mighty Fortress is Our God, in the background. 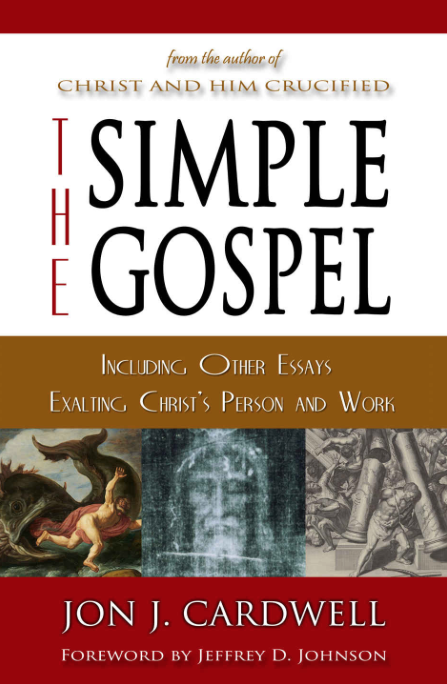 "The Simple Gospel" by my friend Jon J. Cardwell is now on sale at Amazon. I would encourage you to go check it out. 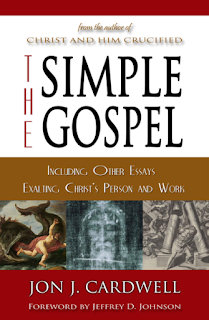 It is a book of essays relating to the gospel, person, and work of Jesus Christ. "Propitiation through Faith," "The Sign of Jonah," "The Shroud of Turin," and the "The Mystery of God" are a few of the many wonderful essays contained within this valuable book. I enjoyed reading them all because I enjoy learning. As I explained in the foreword, which I happen to have been privileged to write, "The manner in which Jon describes the passion of Christ is the most vivid I think I have ever read. I felt like weeping as I read his description of the utter loneliness, emotional humiliation, and physical agony that Christ endured as He was rejected by men and crushed by God." Any book that brings me closer to my Lord in love and devotion is book I love to recommend. The reason I am posting about this book now is that the eBook is currently only 99 cents. This is too good to pass up. If you buy this book, I don't think you will be disappointed. This is why it is so important that I periodically address this issue directly, although it is in some sense included in every teaching I give. In dealing with the subject today, I will follow a very basic outline, first considering how we ought not to think of ourselves and then how we ought to think of ourselves. Under these two basic headings, I hope to address in one way or another the primary issues involved. NKJ Proverbs 8:13 The fear of the LORD is to hate evil; pride and arrogance and the evil way and the perverse mouth I hate. NKJ Proverbs 16:18 Pride goes before destruction, and a haughty spirit before a fall. NKJ Proverbs 29:23 A man's pride will bring him low, but the humble in spirit will retain honor. NKJ 1 John 2:16 For all that is in the world-- the lust of the flesh, the lust of the eyes, and the pride of life-- is not of the Father but is of the world. NKJ Romans 12:3 For I say, through the grace given to me, to everyone who is among you, not to think of himself more highly than he ought to think, but to think soberly, as God has dealt to each one a measure of faith. 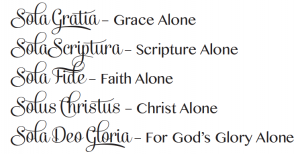 In the following verses Paul goes on to address the many spiritual gifts the Lord has given to the various members of the body of Christ in accordance with His grace (vs. 6). So, when he says that we should avoid thinking more highly of ourselves that we ought to think, Paul means that we should never think that we are better than others in the Church, since we have all received faith from God and are all merely recipients of His grace. Yet Paul clearly assumes that we may all be tempted to be prideful, and he tells us the remedy, namely that we should remember that all we have is by God's grace and not due to anything inherent in us. NKJ Galatians 6:3 For if anyone thinks himself to be something, when he is nothing [μηδείς, mēdeís], he deceives himself. 1) that we are “nothing” in the sense that we are totally worthless as beings? 2) that we are “nothing” in comparison to God? 3) that we are “nothing” in comparison to what we are deceived into thinking we are? I suspect Paul has in mind the latter of these three possibilities. He is speaking in the context of the need to bear one another's burdens by helping one who is caught in some sin, and he warns us to be careful lest we too are tempted (read vss. 1-2). You see, if we are not careful, we can start to think that we are better than another who is struggling with some sin that we might not be dealing with ourselves. But a spiritual person (vs. 1) will realize that he too is capable of falling into sin and will be moved by compassion to help his brother rather than look down on him. The point here is really that we should be aware that a prideful attitude toward others in their struggle with sin necessarily means that we are self-deceived. In this sense we are tricked into thinking we are something when we are nothing. We must realize, however, that are no better than anyone else! We are all just sinners saved by grace! Paul issued a similar warning to the Corinthian church as he did to the Roman and Galatian churches when he put a series of rhetorical questions to them: “For who makes you differ from another? And what do you have that you did not receive? Now if you did indeed receive it, why do you boast as if you had not received it?” (1 Cor. 4:7). Ant any rate, it is clear that Scripture warns us repeatedly about our tendency toward sinful pride. It assumes that we all have this problem, and it expressly teaches us that we ought no think too highly of ourselves. With this in mind, let's turn now to our next major heading. Here I would like to explain how we ought to think of ourselves, according to Scripture, by addressing three modern concepts communicated by three loaded and interrelated terms brought over primarily from pop psychology. The three concepts are 1) self-worth, 2) self-esteem, and 3) self-love. It is my hope that the Biblical view will become clear through interacting with these concepts on the basis of the Bible's teaching. 1. The Concept of Self-Worth – Is it Biblical? 1) We must distinguish between what we are as God's creatures, created in His image, and what we are as fallen sinners. 2) We must distinguish between having worth because of God's love and being worthy for God's love. NKJ Genesis 1:27 So God created man in His own image; in the image of God He created him; male and female He created them. NKJ Genesis 6:5 Then the LORD saw that the wickedness of man was great in the earth, and that every intent of the thoughts of his heart was only evil continually. NKJ Genesis 9:6 Whoever sheds man's blood, by man his blood shall be shed; for in the image of God He made man. NKJ James 3:9 With it we bless our God and Father, and with it we curse men, who have been made in the similitude [image] of God. NKJ Psalm 8:4-8 What is man that You are mindful of him, and the son of man that You visit him? 5 For You have made him a little lower than the angels, and You have crowned him with glory and honor. 6 You have made him to have dominion over the works of Your hands; You have put all things under his feet, 7 all sheep and oxen-- even the beasts of the field, 8 the birds of the air, and the fish of the sea that pass through the paths of the seas. NKJ Romans 5:8-10 But God demonstrates His own love toward us, in that while we were still sinners, Christ died for us. 9 Much more then, having now been justified by His blood, we shall be saved from wrath through Him. 10 For if when we were enemies we were reconciled to God through the death of His Son, much more, having been reconciled, we shall be saved by His life. NKJ Ephesians 2:1-5 And you He made alive, who were dead in trespasses and sins, 2 in which you once walked according to the course of this world, according to the prince of the power of the air, the spirit who now works in the sons of disobedience, 3 among whom also we all once conducted ourselves in the lusts of our flesh, fulfilling the desires of the flesh and of the mind, and were by nature children of wrath, just as the others. 4 But God, who is rich in mercy, because of His great love with which He loved us, 5 even when we were dead in trespasses, made us alive together with Christ (by grace you have been saved) …. So, when we ask of what we are worthy, the answer must be the wrath of God. It is only by His grace that we have been saved and not because we are deserving in any way. May we all learn, then, more and more each day to say sincerely with Paul, “But by the grace of God I am what I am, and His grace toward me was not in vain …” (1 Cor. 15:10a). Do we have worth? Yes, but this should not be called self-worth, as though it were somehow derived from ourselves or as though we may arbitrarily assign worth to ourselves. Rather, any worth that man has comes from the fact that God attaches such worth to him as His creation. I call on all Christians, therefore, to reject outright the use of the term as one that confuses believers and even undermines the Gospel. With this in mind, let's turn now to the second concept. 2. The Concept of Self-Esteem – Is it Biblical? 1) Nowhere in Scripture are we told that we have a problem with esteeming ourselves too lowly. Our big problem is not low self-esteem, but sinful pride! 2) As Christians we must esteem ourselves both negatively and positively at the same time – negatively for who we are in and of ourselves, but positively for who we are in Christ. 1) We may allow ourselves to be trapped by false guilt. For example, this is the problem faced by the one Paul describes as having a “weak” conscience (1 Cor. 8:7). Such a person may think that he or she is unworthy in ways that are not true because they think of themselves as guilty in ways that they are not. The answer to their problem is to learn to distinguish between true and false guilt based upon Scripture. NKJ Romans 7:25-8:1 I thank God-- through Jesus Christ our Lord! So then, with the mind I myself serve the law of God, but with the flesh the law of sin. There is therefore now no condemnation to those who are in Christ Jesus, who do not walk according to the flesh, but according to the Spirit. 3) We may think we are worthless as a being rather than as a sinful being. But this is false, since we are beings made in the image of God. As beings created by God we are worth a great deal, but as sinful beings we are complete unworthy of God's love. So, in all these ways one might say that we could view ourselves wrongly in the sense that we do not take into account the whole truth about ourselves. But we are not faced with low self-esteem. For the answer to each of these dilemmas is not to view ourselves more highly, but rather to view ourselves more accurately. So, again, I call upon all Christians to reject the use of the term self-esteem, especially since it is so often preceded by the word low and thus feeds into the self-deception that leads so many people to mask their sinful pride as some psychological problem and in this way to excuse it. With this in mind, let's turn now to the third concept. 3. The Concept of Self-Love – Is it Biblical? NKJ Proverbs 19:8 He who gets wisdom loves his own soul; he who keeps understanding will find good. This proverb does not see this kind of love toward oneself in a negative light. But, then, this self-love is oriented on seeking wisdom from the Lord, thus seeking the glory of the Lord as one's highest good. It is acknowledging that the best thing one could ever do for oneself is to seek such God-given wisdom. So, it is not possible to love God first without doing the best and most loving thing for ourselves in the process. If we love God first, then our lives will be saved. If we seek His wisdom above the wisdom of this world, then we do the most loving thing we can do for ourselves. If we love God first, then we will also love what He loves, and we will seek His glory first in our lives. You see, God's glory and our good are really not two separate ends; they are inseparably linked, so that, when we seek His glory first, we also seek our own ultimate good. Again one might say, then, that we cannot love God without loving ourselves in so doing, but we can certainly love ourselves without loving God at all! Thus love for oneself, even in a proper Biblical sense, is not the focus of the Christian life. The Christian's focus is not to be love toward self, but love toward God and others! As Paul told the Corinthian believers, Christ died for us “that those who live should live no longer for themselves, but for Him who died for them and rose again” (2 Cor. 5:15). Conclusion: I will conclude with a summary of what we can take away from this teaching. First, the Christian life is a life of declaring God's worth, not self-worth. Second, it is a life of self-denial, not self esteem. And, third, it is a life of selflessness, not self-love. May God grant us the grace to seek His glory above all else, and may He protect us from the self-serving lies of this wicked generation.